Did You Know Bull Surfing in Kerala is Really a Thing? If running with the bulls only makes you think of Pamplona in Spain, think again! A more competitive and dangerous version of this sport (if that’s even possible!) is played in Southern India. Bull Surfing — or the Maramadi Festival — is a pivotal part of the post-harvest season celebrated in the villages of Kerala every year in August. 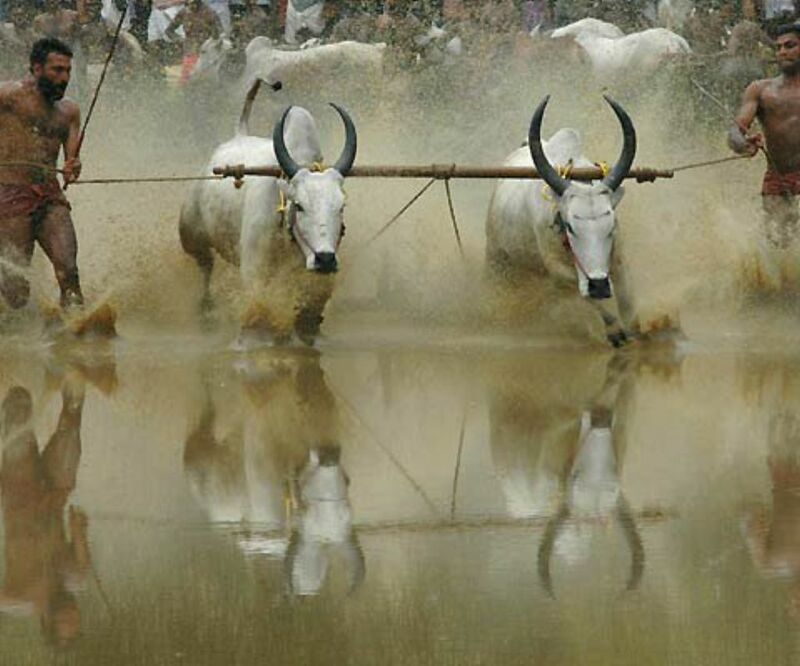 During this fiesta, a pair of oxen/bulls is hitched together in a harness and made to race 100 metres down paddy fields covered in half a foot of water. The field is freshly ploughed and filled with water and mud. When the bulls race down the sloppy field, the muddy water splashes out, creating a thrilling scene for spectators. The bulls themselves are bred and raised for this race a few months in advance. On the day of the race they are spruced up in bright colours, and their horns polished. Each pair of oxen is chased and ‘surfed’ by three men, who are professional jockeys. Two of these men (handlers) flank the bulls on either side by holding a rope to control and direct them to the finish line. The third man (the surfer) sits on a plank of wood between the pair of bulls, who slide through the mud. All three men are soaked in muddy water by the time the race is finished. Several of these bull races are held, but the most famous takes place in Anandapally village, in the Pathnamthitta District of Kerala, around August 15 every year. It lasts for a day, starting around noon and continuing until sunset. About 30 teams participate, and it costs around INR 10,000 (US$155) to sign up. Spectators gather around the outside of the field, cheering and applauding the teams. The swiftest pairs of bulls win cash prizes and trophies in different categories, from Best Dressed Bull to Style and Speed. It’s quite a thrill to watch, and many visitors flock to Kerala to witness the raging bulls and raw courage of the handlers and surfers.